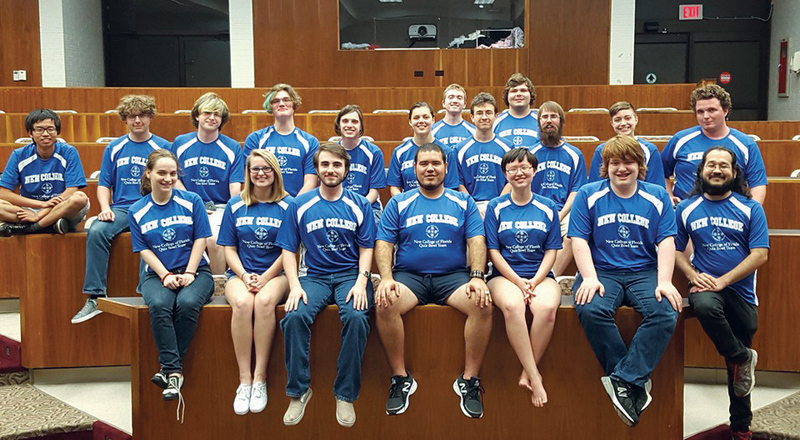 New College of Florida’s 2016 Quiz Bowl Team is establishing themselves as one of the best teams in the American Southeast. New College of Florida’s Quiz Bowl team was in its final regional tournament of the year. The only obstacle between the team and qualifying for the 2016 Academic Competition Federation’s National Quiz Bowl Tournament at The University of Michigan was a final barrage of questions. What Shakespeare play features the St. Crispin’s Day speech? Which German philosopher wrote The Structural Transformation of the Public Sphere? What opera character leaps off of a wall after finding out that Cavaradossi is dead? What peninsula on the Black Sea saw a Mongol siege of a Genoan colony? They charged through and secured a qualifying spot in the national tournament, establishing New College’s quiz bowl club as one of the best teams in the American Southeast. Nothing has stopped the group since its founding one year ago. Naimul Chowdhury and Alexander Koutelias, two first-year students, founded and led the group to victory over the past academic year. Chowdhury was inspired to create the club because of his experience competing with State College of Florida’s team before he came to New College. “Quiz Bowl has an exciting aspect even to someone who doesn’t play. If you’re spectating, you’re trying to think of the answer yourself,” Chowdhury said. Koutelias was approached by Chowdhury and joined as an organizer. “Alex and I had spoken about it before we came to New College. I asked Alex to take on the role as co-president,” Chowdhury said. “[Naimul] has all the connections to the Quiz Bowl community; he was able to teach us so much, while I had prior experience leading clubs. I was captain of the my high school Academic Olympics team for two years, so I was familiar with the concept of team academic quiz competitions,” Koutelias remarked. Together, they assembled a core group of officers and built a member base that numbered over forty students. The team began studying facts whenever they had free time. This ranged from flashcard-style memorization to group meetings where they held mock rounds and quizzed each other on TRASH (Total Recall About Strange Happenings). “It started out as an acronym in the quiz bowl culture. It’s mainly used to refer to anything that is pop culture,” said Yonathan Stone, future co-president of the club. “Whenever we have free time, we read Wikipedia articles or read packets. We do casual packets for fun,” agreed Koutelias. Preparing for tournaments wasn’t the only time when the group had fun. “I enjoy the competition but I also like being on a team with people and we all have fun. You build appreciation for different topics. We all have a lot to learn from each other,” Koutelias said. “There’s almost an immediate gratification in learning something. [Quiz Bowl] gives me the satisfaction of doing something competitive while also not feeling like I’m wasting time,” Chowdhury concurred. The members have learned a great deal about each other from their time spent competing and practicing for tournaments. Chowdhury has a keen interest in math and currently is vice-president of New College’s Japanese club. “I’ve always had an aptitude for language. I like grammar. Grammar is a lot like mathematics,” Chowdhury said. Koutelias, a classically-trained singer, utilizes his knowledge of opera during tournaments and has sung at fundraising events for the club, while Stone builds on the knowledge he gained from growing up in Germany, living in France and Poland and volunteering as a teacher at a school for the blind in Krakow. The coming academic year holds large promises for the team. “We would like to participate in two national competitions next year. We have Division 2 status, and the title of Division 2 National Champion is something we are striving for,” Chowdhury said.